If you don’t have anything nice to say, make pens? While sitting at post today waiting for our next assignment I was scrolling through Facebook and happened upon a dark humor page I hadn’t seen before. Honestly, I have unfollowed or ignored a lot of these pages because I lose my mind, get sucked into arguments and just like recent political internet arguments- nothing changes. As the adage goes, if you argue with a fool we all know who LOOKS like a fool in the end. I get the gist of the joke. It’s not funny. While we’re on the subject of jokes about suicide, that “it’s this way not that way.” That’s not funny either. 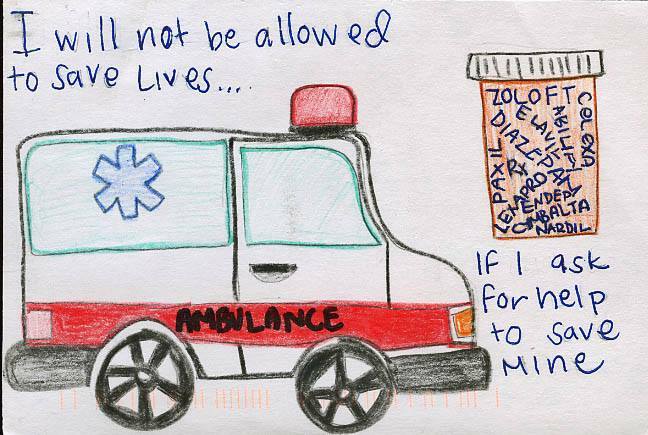 Dark humor and making fun of the most horrible things in the world are ways for EMS providers to keep their sanity when joked about in the right setting. Suicide is never one of those things. What kind of atmosphere does that create for the provider that has been hedging on asking for help, but now feels like a joke because of an offhand comment? How we talk about and treat our patients demonstrates to our brothers and sisters how we might treat them. Awareness and education on provider mental health and suicide are only a piece of addressing this problem. Each of us must commit to changing the culture of our service to allow the helpers to ask for help when they need it. These kinds of statements perpetrate the culture of silence and suicide in our industry. Open lines of communication begin when our brothers and sisters don’t feel judged before they open their mouths. Words are powerful- whether as weapons to tear down or tools to build up. Most of us don’t even realize we are sending unintentional messages. Be aware of the things you say and how you say them. The solution to helping the helpers begins with us. Hardly a week goes by without hearing about providers feeling left out in the planning of the futures of their agencies and the future of EMS in general. It’s true, some providers will never be happy, that is the nature of humans at large and it is present in any profession. Yet, not everyone is jaded, and many do have a point of not having had a voice in the coming change and development of EMS as we grow up. That is, until now. The EMS Compass initiative is being led by The National Association of EMS Officials (NASEMSO) and financed by The National Highway Traffic Safety Administration (NHTSA) to develop EMS performance measures over the next few years. Part of their plan is to invite all stakeholders (providers, managers, agencies, government) to participate via direct suggestion during the Call for Measures this month, informational and public meetings, and transparent communication via direct access to key players. 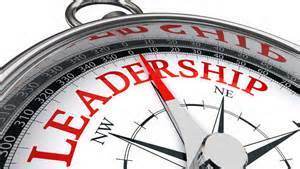 Leaders don’t necessarily need a title. What is a performance measure? Performance measures are common in other industries and have been used in medical practice, but not traditionally in EMS. Performance measures enable providers, management, and government agencies to track and improve performance to benefit patients and communities. Some of these measures will be clinical in nature, but operations, safety, and business/ financial aspects are also included as all of these are needed for well rounded agencies and further development of a well rounded industry. Performance measures don’t have to be complex or convoluted. In actuality they are quite succinct. For example it is widely accepted that patients with cardiac chest pain should take an aspirin. The performance measure for that event would read: All patients who have chest pain of a cardiac nature should receive aspirin. This would then be documented via charting we already complete and reviewed later for quantification. Many things we already do such as standards for STEMI, TXA for Stroke patients, or even trauma protocols were founded in related medical professions performance measures. -The measures are evidence based. We are Emergency MEDICAL Services and should be practicing medicine in the way that other medical professions do, with evidence not today’s whimsical idea on how to get “cool toys”. -Provides means of measuring long term performance in our industry so when the next generation of providers arrive, they can build on the foundation we have laid. -Currently, if your agency bills, you are paid for service whether the patient is treated well clinically and will have an improved outcome or pleased with how they were treated, Medicare will pay for the transport. In the future, in conjunction with The Affordable Care Act (ACA or Obamacare) we will be paid for the outcome: clinically accurate care, patient satisfaction, etc. Hospitals have been preparing for this for the past few years, we should not be naive to think the government will not try to limit our payments. -Medicare is encouraging other insurance companies to follow suit on requiring a higher standard of care for payment for EMS services. -Can lead to better provider compensation, improved provider safety and health, and better recognition of the job we do and love. Obviously, the above is a very simplified over view of what EMS Compass is and will achieve. I have included links below for your information. There is a great webinar you can access on demand that explains how the process works and the history of data collection in EMS. I also included links to the Call for Measures that is live until the end of May, so get your measures in. I also included links to some other blogs and podcasts that have been talking about EMS Compass recently. 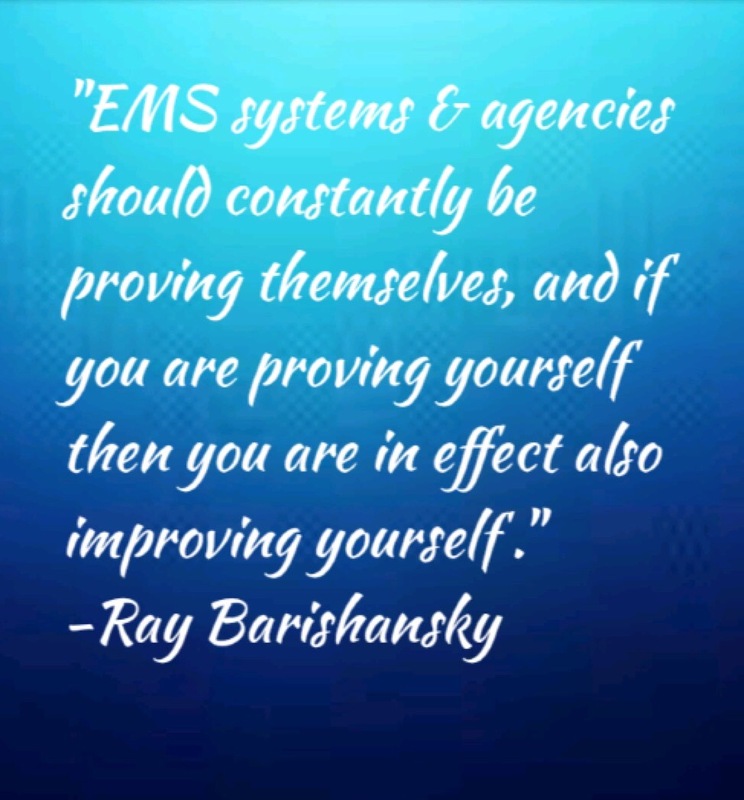 Until a standard is set industry wide, EMS as an profession will flounder. EMS needs to define acceptable standards of care on an industry wide level, the lowest common denominator can no longer be our standard if we are to grow into the industry we desire. Much of what is described above are things we already do, we are just organizing and tracking it now. We must to take ownership of our profession before someone else, who has no idea what we really do, tells us how to do it. You can be a part of the future of EMS on a larger level than you ever imagined by contributing to the call for measures by May 31, 2015. There is a great hypocrisy in the world of Emergency Services. Our job is to help people in any circumstance, at any time, at any place usually where unimaginable scenarios present themselves. These are the worst days of peoples’ lives, but they shouldn’t affect responders…at least that is the popular conception within our circles. This is why our coworkers, employees, partners, mentors, friends, brothers and sisters fall prey to treatable conditions unseen and unheard. We look away at the worst time of their lives when they need the most help, but cannot ask for it. Some responders even commit suicide. These are our friends! We swim in each others pools and eat each others food. We celebrate holidays together when we cannot be at home. Our children play together and we tell each other secrets our loved ones wouldn’t begin to understand. Yet we might as well show up to the funeral en masse in our dress blues and turn our backs for how some of their families are ostracized. Got cancer? We have a fundraiser. Got injured? We come help around your house. Have PTSD and kill yourself? Oh, I’m sorry, do I know you? 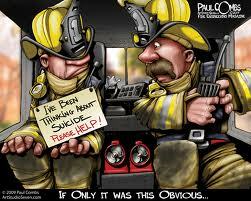 There are no hard and fast statistics related to EMS or Fire related suicide. Quite honestly, there are no statistics related to suicide by EMS providers. There are several reasons why: 70 percent of fire departments in the United States are volunteer departments and death certificates are completed with a profession noted, not volunteer activities. 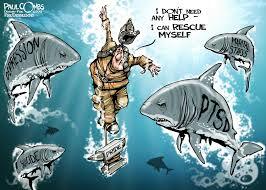 Until recently the hero culture and machismo within Emergency Services had absolutely no room for discussion on first responder suicide, but like many things, the military attention on PTSD and responders with PTSD after 9/11 have shifted our attention to the topic. The demographics within the EMS community are more varied than the Fire Service, but we are all exposed to some high risk factors for suicide. We are all exposed to violence on a higher level than most citizens, whether via patient care or being assaulted during the incident ourselves. Death is encountered by first responders in the normal course of duty and the loss of one’s life is accepted as an occupational risk. A study, Occupational Fatalities in Emergency Medical Services: A Hidden Crisis, published in the December 2002 Annals of Emergency Medicine found that EMS providers are almost as likely to be killed at work as police officers and firefighters. Between 1992 and 1997, 12.7 per 100,000 EMS Providers died at work compared to 14.2 per 100,000 police officers and 16.5 per 100,000 firefighters. The national average for the working public is 5 death per 100,000 workers. We are also exposed to suicide or attempted suicide at higher levels than most citizens. This elevated exposure desensitizes providers to violence, death, and suicide and can lead to disinhibition and likely a more evolved capability for suicide than the general public. Many non-demographic risk factors of suicide related to Emergency Services include alcohol abuse, mental illness, divorce or separation and the presence of a firearm in the home. As you are well aware, we work long hours at multiple jobs, we don’t get paid very much, we deal with copious amounts of stress on a daily basis and this can lead to a myriad of difficulties in our personal lives without an outlet to release it all. We all know someone, or maybe have had personal experience, with financial difficulties. Having a strong work ethic is commendable, but 100 hour weeks dealing with everyone else’s problems is bound to lead to problems of your own. After working all those hours that’s just enough money to live in a tiny apartment eating butter noodles because that is all you could afford after paying your bills so you could get to work to do it all again next week. We have all been cheated on or know someone who has or is currently involved in a love triangle (or square). Everyone knows everyone else’s business in our world and in twenty years people will still remember. And whisper. If you are married or have a relationship with children involved this can lead to custody issues and likely a lawyer bill that your butter noodle budget cannot afford. You know what happens when you don’t have a lawyer. I’m sure we also know someone that lost their home because things got out of control and lived in their car and showered at the gym or work. As if ALL that wasn’t bad enough add being ignored and told to “man up” to the list. The solution to the issues listed above is not simple or easily unraveled, some of it is the nature of the beast and some are personal choices. These issues need a national forum for solution and voices from members of our community demanding change and improvement. Some of these issues need better decision making skills in our personal lives as well. It won’t solve the problem of suicide outright, but improved lives and life choices will contribute to stemming the tide. While there aren’t many numbers to quantify first responder suicide what we do know about suicide in general is alarming. Of those who completed suicide, 70 to 80 percent suffered from alcohol abuse and a mood disorder, 40 to 60 percent were intoxicated at time of death and 56 percent used a firearm to carry out the suicide. These are statistics for the general population, but closely resemble the majority of first responders. In a study conducted by the International Association of Firefighters (IAFF) alcohol abuse was qualified as more than 2 alcoholic beverages a day for men and more than 1 alcoholic beverage a day for women. The “two” beers and shots at the bar or party on your day off is qualified as binge drinking which is related to alcoholism as well. Some other alarming numbers: various studies have cited PTSD rates, specifically related to firefighters, range from 16 to 24 percent while the average for American adults diagnosed with PTSD in their lifetime is 6.8 percent. While suicide can be preceeded by a number of mental health issues, recent studies are linking PTSD and Suicide. Per the Mayo Clinic, PTSD symptoms can include: flashbacks, upsetting dreams about the event, reliving the event, avoiding thinking or talking about the event, feeling emotionally numb, avoiding activities once enjoyed, hopelessness about the future, memory problems, trouble concentrating, difficulty maintaining close relationships, irritability, anger, overwhelming guilt or shame, self-destructive behavior, trouble sleeping, being easily startled or frightened, and seeing or hearing things that aren’t there. Unfortunately, many of us, including our leadership are not educated on these warning signs. Alternatively, the psychiatric and counseling communities are not usually well versed in our culture to understand the unique parameters that define our workplace. Fire, Police and EMS units (unless aligned with a hospital) do not typically have Employee Assistance Programs (EAP) to call and speak with. Those that do have programs in place still have providers with fear that their job will be affected. These responders either pay out of pocket to go to a counselor of their own so the treatment does not show on their insurance or don’t do anything at all, letting the feelings grow in strength. There are many wonderful people advocating and researching PTSD and First Responder Suicide. Peggy Sweeney of the Sweeney Alliance promotes educational programs for dealing with stress, trauma and grief and writes several newsletters including Grieving Behind the Badge. Her colleague, Shannon Pennington is the founder of The North American Firefighter Veteran Network and together they have produced a training program for first responders called FIRST STEP HOPE: Not All Wounds are Visible. 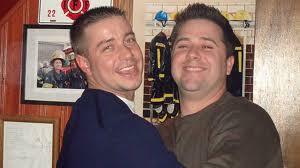 Both have been first responders and understand the difficulties faced in our line of work. Jeff Dill holds a Master’s degree and is a Licensed Counselor. He is also a Captain at Palatine Rural Fire Protection District in Inverness, Illinois and the founder of Counseling Services for FireFighters. He educates leaders on the importance of counseling and awareness of PTSD and Suicide. 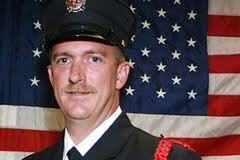 He is also compiling statistical data based on confidential reports of Firefighter and EMS provider suicides. Awareness, like many other topics in our profession is key to prevention. Having an Employee Assistance Plan (EAP) and CISD Teams and leader education is a great first step, but until the change in our culture flows through the ranks, our brothers and sisters will continue to be cut down by this seemingly silent killer. Ask about your workplace EAP Plan or why you don’t have one. Educate yourself on issues that affect providers socially and emotionally and ask to have them addressed. Help each other when you notice a change. Let your legislators know EMS needs funding for studies on these issues and ask what they plan to do about it. We strike for better pay and health benefits, we complain to get better couches or recliners to watch TV in, we gripe about not enough milk in the fridge for afternoon coffee. Why don’t we speak up and stand in the gap for our friends and ourselves? Who will pay attention if we don’t? How will the culture change if we don’t change it?